I miss the sun. It’s no secret. It’s raining here in New York and it’s cold. So this week, I’m sharing a travel destination story from my previous life in South East Asia. If you are planning a trip to Thailand in the near future, a romantic getaway, or dare I say it – a honeymoon, this could be the place for you. Even if you aren’t planning a trip to Thailand… now might be the time to start. I had the absolute pleasure of spending a night and day at Six Senses in Koh Samui, Thailand, just a little while back. On arrival into Six Senses I felt immediately at home. Not in a ‘home from home’ sense, but more in relation to the fact that I like to think of myself as an ‘off the beaten track’ traveller. I love to explore the unknown, and delve into the little nooks and crannies of this earth not already widely advertised. True, the Six Senses Resorts are world-renowned and no secret at all, but for people like me who may have been travellers on a shoestring in such destinations as Thailand and Malaysia in the past, this resort was a fabulously new experience, and just out of this world. It’s what I might like to call; accommodation for the ‘champagne backpacker’. And when I say champagne, I mean Cristal, not sparking Chardonnay. And by ‘backpacker’ I am using it in the loosest sense of the term, (i.e.) was a backpacker a decade ago – and although I would like to re-live some of those Koh Pha Ngan sunsets under the trees, I can’t, I’m far too old. Perhaps these days, we could refer to our older selves as ‘adventurers’. At Six Senses, you can be utterly spoilt, yet still feel a tiny little bit adventurous, like Robinson Crusoe. 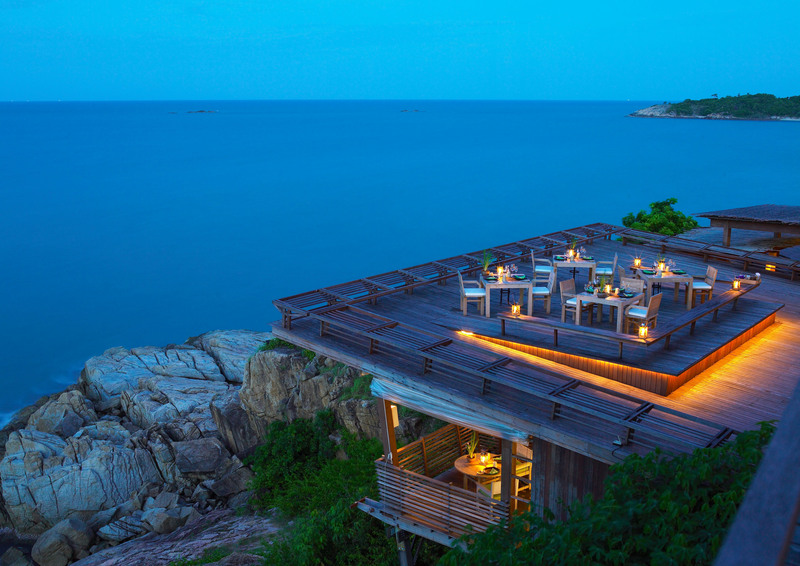 Six Senses is located on the headland on the northern tip of Koh Samui, in the Gulf of Thailand. It is nestled within twenty acres of indigenous vegetation and boasts unspoilt views across the Gulf of Siam and neighbouring islands. With sixty-six uniquely designed, split – level villas, two restaurants, a health spa, and an outdoor (infinity…) pool, plus a small private beach, there really is no need to leave this place… ever. Really, EVER. The staff welcomed me by name, and I felt momentarily like royalty. We were luckily upgraded to a pool villa, which was a free-standing wood and bamboo hut with its own infinity plunge pool, an outdoor terrace, gazebo and a view over Koh Pha Ngan that simply cannot be put into words. You see, what I noticed here, was that when I settled into my private hut, with unspoilt views, a sunken bathtub, bamboo basin and eco shower, I, at first and in true spoilt western style, felt slightly miffed that there weren’t any branded mini toiletries to take back home and either give to friends (with a marginally superior nod as you hand it over), or stuff in your soap bag and promptly forget about until the next holiday. I also felt upon first impressions, that the hut was possibly a little over – rated at the price, wasn’t it no more than any other Thai hut with 5 star views? How wrong I was. 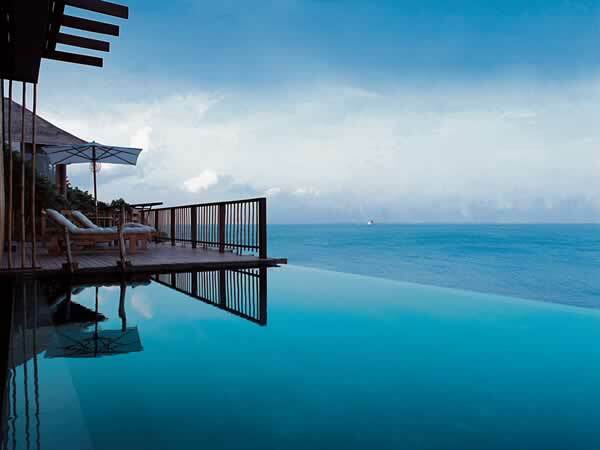 Once I begin to unwind in Six Senses, I quickly realised, no detail is over – looked. Soon after our bags had been dropped we were invited for a welcome drink in the bar. 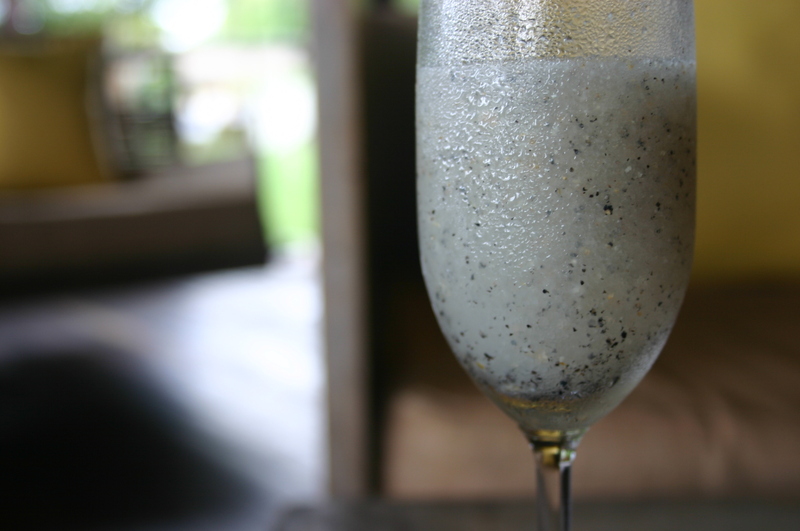 If you could pour cooling, delicious and welcoming comfort, into a champagne flute – then this is it – right here, the welcome drink at Six Senses. The way the hotel is landscaped into the side of the hill, means that whether you are sitting outside your room, walking along one of the tracks or sitting in the bar or restaurant, you always feel a little secluded. Even the small private beach, Ban Lai Maen, has an element of castaway… not a garish sun umbrella or bar in sight.. just some gentle waves, licking at the warm sand. As we wandered along the shaded path back to our room, I felt an overwhelming love for the place – like I’ve never felt before in a hotel. So what if you couldn’t take any fancy toiletries with you… this place had pre – emailed me to ask me my favoured aromas. Why, I had originally wondered? Once I hopped in the shower, I realised they had asked so they could fill the refillable clay pots in the shower with a body wash of my choice. How touching. It’s like when someone takes the time to write you a letter or a poem, or bake you your favourite cake rather than giving you an expensive and thoughtless gift voucher. We ate that evening, after a lazy dip in our own pool up at Dining on the Rocks, one of the finest dining experiences in Samui. The Rocks is a soaring wooden deck, comprising of ten terraces with 270 degree views. And if that sounds a little too much – you really ought to try the food. With local produce and on site sustainably grown fruit and vegetables there is no questioning the lengths Six Senses will go to remain environmentally responsible. We sampled Tomorrow’s Chicken Burrito and a Canned Tuna Fish Sandwich to start, the names, similar to the bamboo hut you think you are checking into – will fool you. Followed by Fish and Chips fit for any London eatery and melt in your mouth Waygu Beef Cheek. We finished the last dregs of our organic red wine with a dessert – Variations in Dark Chocolate, served on a piece of dark slate. It was one of the most delectable menus I’ve ever eaten, and possibly one of the highest above sea level. All the guests at Six Senses are holidaying with a minimal ecological impact and very little carbon footprint. The resort follows a Holistic Environmental Management Program (HEMP). They create their own bio diesel. They filter and recycle all waste water. And they work alongside UNICEF and Restaurants Against Hunger. In each room and suite is a selection of books on their minimal environmental impact and charitable work to further guest education. The entire minimal yet relaxed design is sustainable and very much within its own environment using materials such as cane, bamboo and other raw materials. When we checked into Six Senses, we had recently left another beautiful Samui hotel, and admittedly, on the free toiletries and fancy stuff front, they won hands down, if you like that kind of thing. My love affair with it was short-lived after this holiday. What staying at Six Senses taught me, is that no one can take away your memories, this is one I replay time and time again. 24 hours in this place, and you will never want to leave. 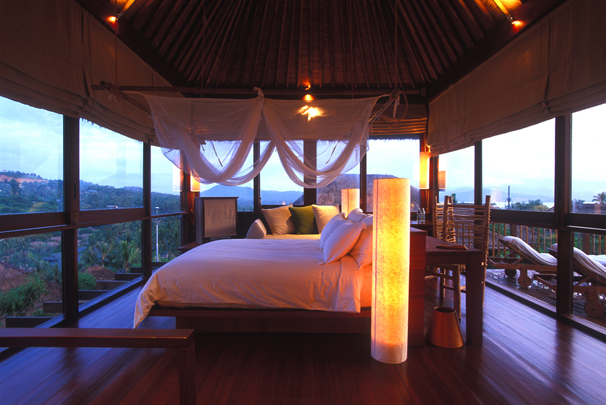 Six Senses Samui is a luxury hideaway eco-retreat. It is superbly luxurious, but in a mindful way, which for me, makes it all the more special. I can safely say that when we walked away from this short break, the only footprint we left… was in the sand.